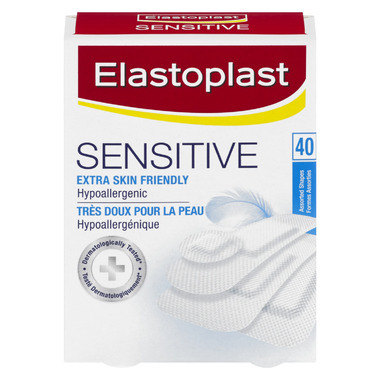 The Elastoplast Sensitive Bandages are hypoallergenic and extra skin-friendly! With 40 assorted shapes, Elastoplast Sensitive Bandages will provide flexibility and protection in keeping wounds protected. These are the only bandages I use. I'm allergic to conventional adhesives and these work for me. They stay on well. When I peel them off they do leave a sticky residue, as someone else mentioned, but it comes off with easily with soap and water. Finally, a bandaid that doesn't pull my skin away when I go to take it off. These live up to their name and are indeed "skin friendly." These are much harder to remove than regular bandaids. They leave a lot of glue on the skin. But no skin reactions. My son has an adhesive allergy and these are the only bandages he can safely wear. The bonus is that they actually stay on. These bandages have been a life saver. Not only have I found them to be super, but I have sent them to others who have problems with their skin and they are also pleased with the results. These are great for sensitive skin, however they don't stay on for long. Will still use them as they cause no skin reaction.